Dogs can eat peanut butter in moderation, with the healthiest options being homemade or unsalted versions. Peanut butter contains high amounts of protein and Vitamin E, which are essential to a dog’s health. It is important to discuss portions with your veterinarian to ensure you don’t overfeed this tasty snack to your dog, as excessive amounts can lead to obesity and illnesses. In general, when feeding a dog peanut butter, the 10 percent rule should always be considered, which is that dog snacks and treats should only constitute 10 percent of a dog’s diet, while the remaining 90 percent should consist of healthy dog food and dog-friendly veggies and fruits. It’s also important for dog owners to feed their dogs peanut butter with low trans-fat contents, as consumption of high amounts of trans-fats can possibly lead to diabetes and heart disease. While a common belief is that sugar-free peanut butter is a better choice than standard peanut butter, the reality is that many types of sugar-free peanut butter contain the ingredient xylitol, a natural sugar alcohol that is often used as a lower-calorie substitute in products such as sugar-free gum, yogurt, breath mints, and diet sodas. While xylitol is a natural ingredient, this ingredient can cause an accelerated release of insulin in dogs, which in turn can lead to life-threatening hypoglycemia. While excessive amounts of sugar aren’t good for animals or people, in this case, it’s much better to feed your dog limited amounts of the real stuff to avoid potential complications. Signs of xylitol toxicity in dogs include depression, weakness, lethargy, tarry stools, and accelerated heart rates. Dogs may also experience tremors and appear to be “drunk” as they walk around. If you suspect xylitol poisoning in your dog, contact your veterinarian or take your animal to the veterinary hospital immediately. Xylitol poisoning can be avoided by checking labels of all food, drink and snack items prior to purchase. Since dogs have a tendency to rifle through cabinets and find snacks on their own, it’s best to stay safe and keep anything containing xylitol out of the house. Peanut butter can also be used as a treat when you’re attempting to feed a stubborn dog medications or vitamins. Many dog owners wrap vitamin pills in cheese, then slather on some peanut butter, feeding the dog a delicious treat with pills hidden inside. 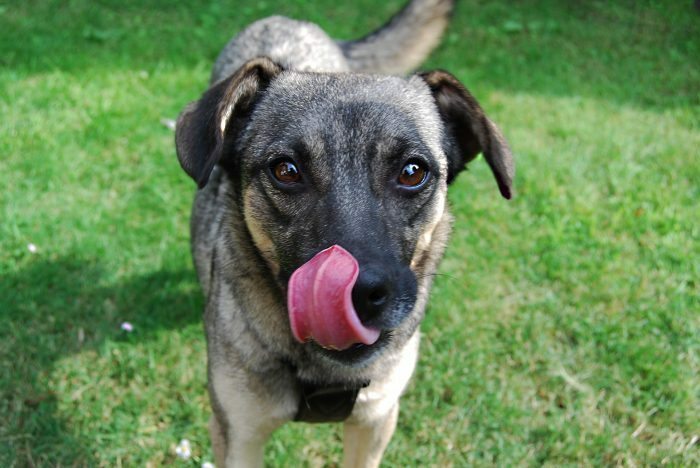 Giving dogs a spoonful of peanut butter for good behavior is also a common practice. In fact, peanut butter and dogs has become such a common pairing, that many dog treat manufacturers are creating treats with doggie-safe peanut butter in the ingredients. With clever names such as “Dogsbutter,” these products are already deemed safe for dog consumption and promote healthy skin and shiny coats. In addition to peanut butter, there are several other “human foods” that are safe and healthy for dog consumption when served in moderation. Baby carrots, cooked chicken, yogurt, salmon, pumpkin, and eggs provide vitamins, minerals, and protein, making these items a great alternative to overly-salty dog treats. The FDA recently put out a statement regarding “human food” consumption by dogs and advised against certain foods. While extremely tempting to dogs, raw meat can cause salmonella, and there is also a high risk of choking on bones. While grapes and raisins are a sweet and healthy treat for humans, in dogs these fruits can become toxic and lead to kidney failure. Macadamia nuts and chocolate can also cause toxicity in dogs, while overly salty foods can lead to hypertension. Onions are another common food that are healthy to humans and toxic to dogs, whether cooked or raw. Onions contain chemicals that hinder red blood cell transportation in dogs, which interferes with oxygen flow, leading to anemia. Incidences of onion toxicity are extremely rare, but it’s important that dog owners are aware of all potential dangers in their kitchens. Note that information provided on this site is for informational purposes only and is not a substitute for professional medical advice. Please see your veterinarian to diagnose specific concerns for your pet or animal. Two Cats Befriend a … Snail?